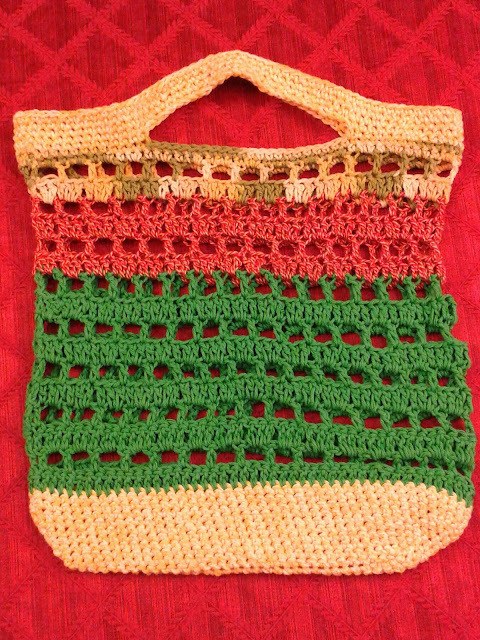 Last year, around this time, I made a whole load of market bags in cotton as gifts. This week I knocked one up for my all time favorite school staff member and fellow Brit who is going into hospital for an operation a week before school finishes. The pressure is on. So I have found a great looking market bag pattern by Erica Jackofsky on about.com and I've sourced sufficient co-ordinating cotton yarn from my stash and I've completed it, Yay, just in time. However, I load the bag up and it stretches and I think "oh no, why didn't I remember this is what happens with these bags". I have made so many of them and I completely forgot. My 8 year old son said it looked fine if I just put it down on the table and also suggested stuffing more things in the bottom. He's so great at fixing problems - practical and emotional. And I was distraught and out of time. Anyway, had to undertake a high risk last minute alteration, cutting one section completely out of the bag. Then single crocheted the top to bottom leaving a slight ridge "feature" but mission accomplished. 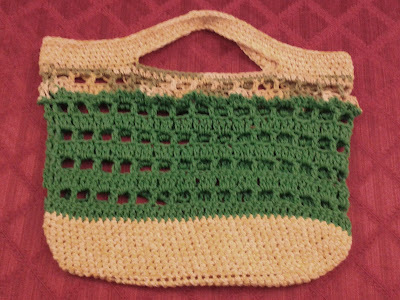 Surely if I immortalize my error in a blog post I won't forget the stretchy nature of market bags?? I did so like that red stripe but it had to go. Aaahhh that's so much better!